There were a few posts earlier in the year about the temporary disappearance of the SSBR website. This is just to remind everyone that the SSBR site is now up and running again and still has all its mine of barge information. Many thanks to John White for persevering with it. Very well attended SSBR AGM today at The Three Daws, Gravesend. The room was full. Chairman, Elizabeth Wood, had come to the end of her three year term of office, in which much has been achieved. She thanked all her fellow Committee members for their help to her and to the Society. Secretary, John White, said that inquiries from people seeking information about barges on which family members had worked, etc, averaged two a week. In addition, he was working on a book about the 4,500 sailing barges for which he held records. It would probably be called something like The Barge Directory. He was making good progress with it, but there was still much to do. The earliest barge he had found was built in 1751. Treasurer, Graham Dent, presented audited accounts for 2014, which showed a loss of £2,877, but this had been caused for good reasons. There had been extra expenditure to mark our 50th anniversary year, and members had received free of charge two books, The Prowess of Charlie Fielder and Still in the Samphire, which involved printing and postage costs. Excellent value for members. Graham thanked Chris Snelling for examining the accounts. Membership Secretary, Margaret Blackburn, reported that membership in 2014 totalled 421, so keeping us well above what had been our target of 400. 27 new members had joined in that year. To date, in 2015, 369 membership subscriptions had been received, including 9 new members, so hopefully we would maintain our numbers and maybe increase them. Charles Traill, Editor of the twice-yearly Mainsheet, said he was very grateful for the news and information provided to him by members and for photographs he was sent. He thanked Margaret and Brian Blackburn for proof-reading and despatching the magazine. Next year would see the 100th edition of Mainsheet published, and in the same year the annual Topsail publication would reach its 50th edition. So something special would be needed. As well as being Editor of Topsail, Richard Walsh co-ordinates other Society publications and keeps us informed about other barge publications. 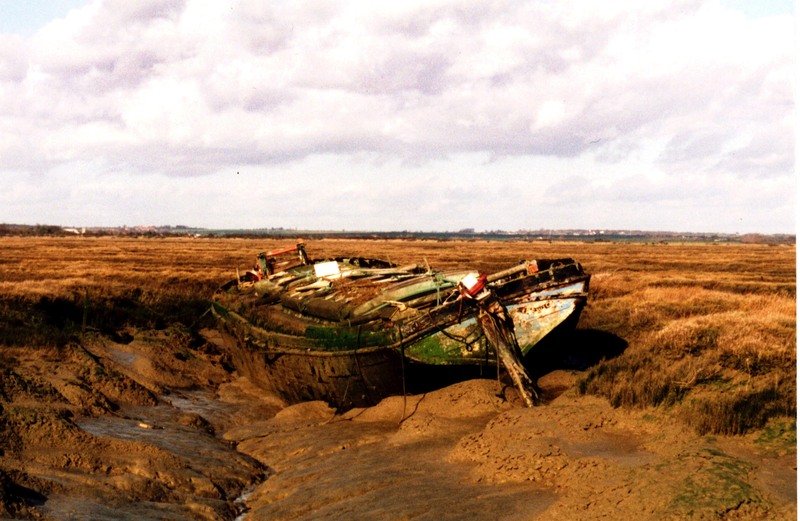 Still in the Samphire by the late David Wood reflects the history of the Society gathered from Committee minutes and the recollections of David and other members, and had been published in 2014 to celebrate the Society’s 50th anniversary. Also written by David Wood, (a long-serving Committee member), together with Richard Walsh, is The Prowess of Charlie Fielder. It has received excellent reviews, including one by a distinguished reviewer who described it as “ground-breaking”. The next Society publication, (currently being prepared), is the history of EJ Goldsmiths of Grays, the company which had the biggest fleet of sailing barges. It is being written by Graham Dent and edited by Richard Walsh, with many pieces of information about both the fleet and the Goldsmith family continuing to be received. Our Archivist, Don Wright, reported that 2014 had been a good year for the donation of photographs, manuscripts, books, etc, to our Archive at Fambridge. More than 16,000 items had now been catalogued, with a further 4,000 partly done. Don said that members were welcome to visit the Archive by appointment, and that anyone who wished to do so should contact him. The next item on the Agenda was the election of officers and Committee members followed by the presentation of the Society’s three trophies to the winners for the year. Richard Walsh was elected SSBR’s new Chairman; Charles Traill was elected Vice Chairman; the other members of the Committee were re-elected, to be joined by a new member, Linda Hoy. Since the meeting, Tim Mileson has been co-opted to the Committee. Half Model – Robin Neale for cataloguing the Charles Dance collection. Colindell – Toby Lester and Linda Hoy for the restoration of sb Ironsides. Deadeye – posthumously to the late David Wood for The Prowess of Charlie Fielder. Chairman Emeritus, Tony Farnham, kindly donated a barge picture – a steel engraving – to be raffled for the Society’s funds. After a break for a welcome cup of tea, two films were shown: a short dvd made by Robert Gillard of his father’s cine film of the 1966 Medway match, and one by Simon North about the restoration of sb Centaur. See what you’re missing if you’re not a member! 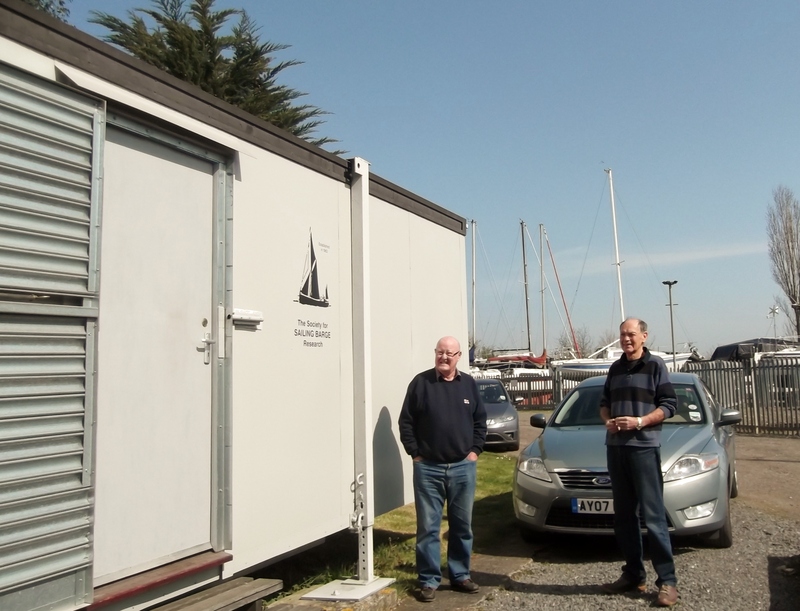 Great news – there’s going to be a Fambridge Festival at North Fambridge Yacht Station on Sunday 24th May, and SSBR will be there. happy to talk to visitors about barges and the Society. Our books and magazines will be on sale and we shall, of course, also have membership forms there. 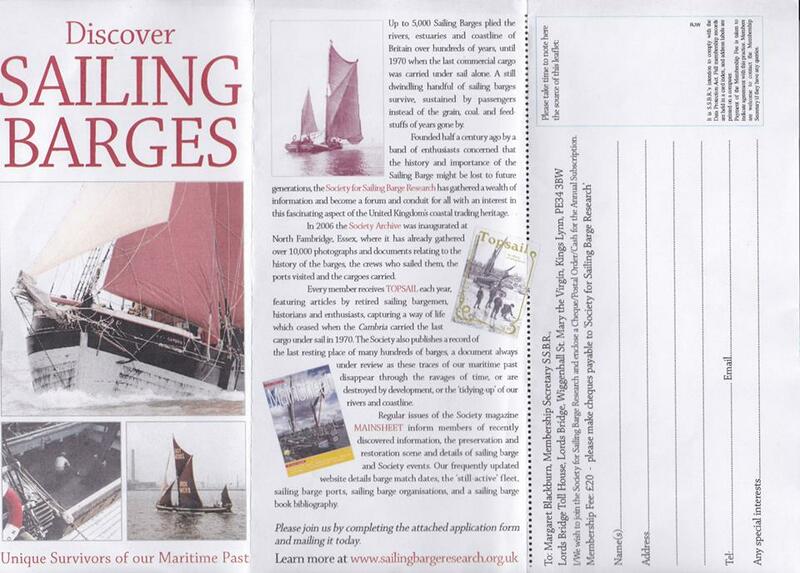 At £20 a year it is great value and you will receive our two excellent publications, Topsail annually and Mainsheet twice a year. And members receive occasional books published by the Society for Sailing Barge Research free of charge; last year there were two excellent such freebies, Still in the Samphire, the Society’s 50th anniversary history, and The Prowess of Charlie Fielder. The festival will coincide with the Old Gaffers Association 30th Anniversary Crouch Rally visit to the North Fambridge Yacht Club. There will be gig racing on the river, and stands including those taken by the Coastguard, the RNLI, a sail-maker, and many more. sb Ironsides will be present. More details nearer the date. We have more sad news to record, with the death suddenly on Boxing Day 2012 of Frank Thompson, after a very brief illness. Frank, who lived in Layer-de-la-Haye, was 92. He was a member of SSBR and often contributed to Topsail and Mainsheet. He and his wife, Kathleen, sailed on many barges in the days of trade, particularly with the late Stan and Chick Yeates on board sb Glenway. Both Richard Walsh and John White heard from Frank just before Christmas when his notes were full of news. Indeed, he gave John a few additions for The Sailing Barge Compendium. The funeral will be on Monday 14 January, at 12.30pm, at Colchester Crematorium. All are welcome at the service, where Jimmy Lawrence will be performing the shanty Happisburgh Light, and afterwards at the Donkey & Buskins pub, Layer-de-la-Haye. Frances Dalesman, who volunteered on sb Memory in 1961, has contacted us asking for information about her. Our splendid Hon Secretary, John White, has come up trumps again, and has provided the following which has been passed on to Frances direct. We thought, though, that it was a story which others might like to read.